My Tooth Broke! Do I Need Dental Crowns in North Naples? Many people don’t realize the versatility that dental restorations can provide. Not only are they great at restoring your appearance, but they protect your remaining teeth and gums from contracting dental disease. Without dental crowns in North Naples, you’d be vulnerable to infection. This only increases the chances of needing a root canal or even tooth extraction. If you’re hesitant on getting dental crowns, take a moment to learn about the many benefits they provide. According to your dentist, it’s about more than looks; your oral health is at stake. While teeth are strong, a bad fall or trauma to the face can still cause a tooth to crack or even fracture, leaving you in pain and unable to eat food the same way until you get it fixed. However, sometimes a crack can occur even when you’re simply chewing on a tough food. Hard candies, tough meats, thick-cut toasted bread, and ice are all culprits for cracking teeth, particularly if the tooth is already worn when it occurs. A common way your dentist in North Naples can help you with crowns is when a molar is cracked but does not extend to the root of the tooth. Any root damage would constitute as a dental emergency and needs to be addressed by your dentist right away. Cavity? Discolored Teeth? Worn Tooth? Dental crowns in North Naples can help you in many other circumstances as well. If your tooth is suffering a severe cavity and a filling isn’t enough to restore it, a dental crown can cover the affected area quite sufficiently. This protects the remaining tooth from exposure to oral bacteria, which can easily cause an infection. 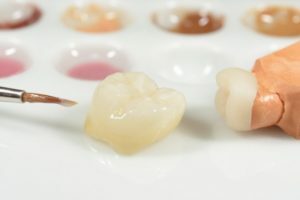 Additionally, if your teeth have become significantly discolored, a porcelain dental crown is a great way to restore its appearance while still protecting it. If your teeth have become worn down, typically as a result of bruxism (teeth grinding), a dental crown can prevent further wear. Make sure you start wearing a nightguard while you sleep to protect your restoration and remaining teeth in the future. If your dental crowns in North Naples crack or chip in any way, the first step should be to call your dentist. If your tooth has become jagged or you feel soreness, you may need to visit an emergency dentist to have it treated. If not, you can wait a day or two until your appointment. Until then, check the affected area and look for missing or dislodged pieces of the crown. If you’re afraid of swallowing the crown, check if it’s loose enough to remove. Afterwards, rinse your mouth with warm water and apply gauze to the area if bleeding occurs. If you can’t see your dentist but want to keep the crown in place, purchase dental cement from your local drugstore and follow the instructions on the label. Dental crowns are here to help in your time of need. Schedule a visit with your dentist today to learn more! Dr. Mark Makram is skilled in general, cosmetic, and implant dentistry and enjoys providing patients the best care possible. After graduating from the State University of New York at Buffalo School of Dental Medicine in 1993, he moved to Naples in 1997 and has been practicing ever since. To learn more about his dental crowns or practice, contact him at (239) 513-9990 or visit his website. Comments Off on My Tooth Broke! Do I Need Dental Crowns in North Naples?